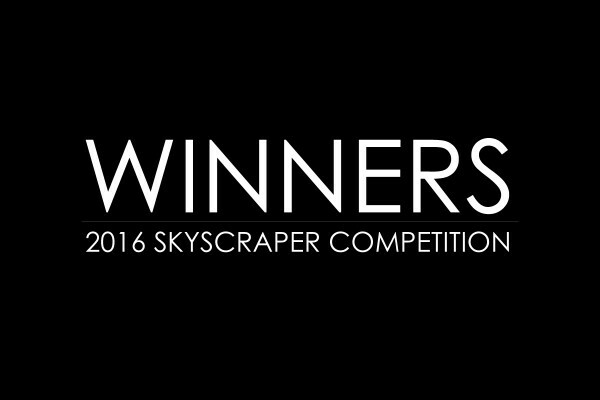 eVolo Magazine is pleased to announce the winners of the 2016 Skyscraper Competition. The Jury selected 3 winners and 21 honorable mentions from 489 projects received. The annual award established in 2006 recognizes visionary ideas for building high- projects that through the novel novel use of technology, materials, programs, aesthetics, and spatial organizations, challenge the way we understand vertical architecture and its relationship with the natural and built environments. The FIRST PLACE was awarded to Yitan Sun and Jianshi Wu from the United States for the project New York Horizon. The design proposes a continuous horizontal skyscraper around the full perimeter of a sunken Central Park. The project would create 7 square miles (80 times greater than the Empire State Building) of housing with unobstructed views and connection to the park. The Hive, designed by Hadeel Ayed Mohammad, Yifeng Zhao, and Chengda Zhu from the United States received the SECOND PLACE. 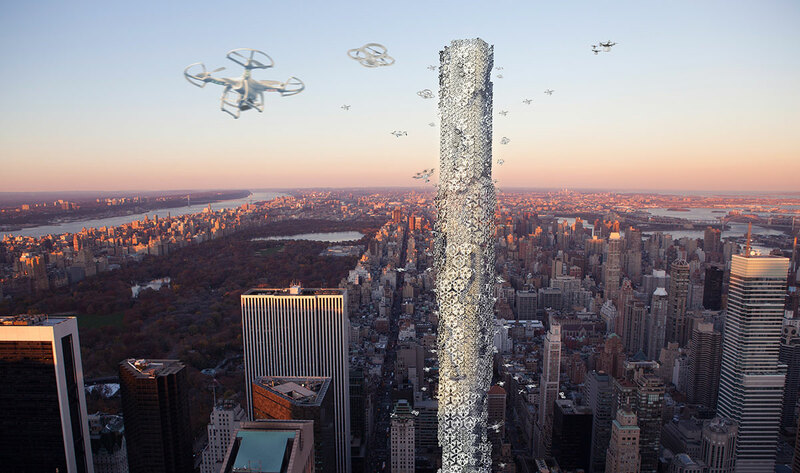 The project imagines a vertical control terminal for advanced flying drones that will provide personal and commercial services to residents of New York City. 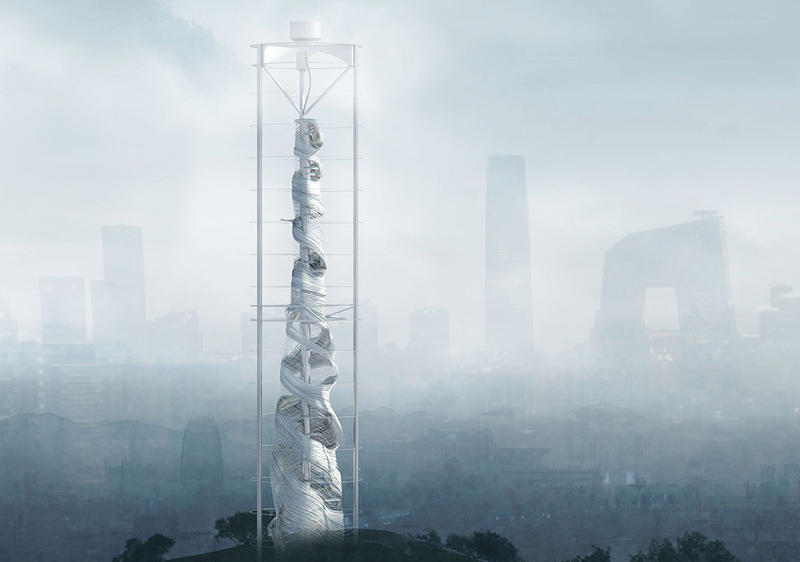 The recipients of the THIRD PLACE are Valeria Mercuri and Marco Merletti from Italy for the project Data Tower. The proposal envisions a sustainable skyscraper in Iceland designed for Internet servers. Among the 21 honorable mentions there are skyscrapers that purify air, buildings conceived to create rain for the driest regions on Earth, vertical cities, sensory towers that explore our psychological relationship with space, and skyscrapers that prevent cities to sink. The members of the Jury are: Matias del Campo [principal SPAN], Thom Faulders [principal Faulders Studio], and Marcelo Spina [principal PATTERNS]. The 2016 Skyscraper Competition was made possible with the sponsorship of our media partners and v2com. eVolo Magazine is also pleased to announce the publication of EVOLO SKYSCRAPERS 3, the third book in the Skyscraper Series. This publication includes the best 150 projects received in the 2014, 2015, and 2016 competitions. This is a limited edition book and only 500 copies will be available worldwide. As the busiest and most densely populated county in America, Manhattan has always been a big fan of skyscrapers. Limited by its street grid, however, buildings in New York City are often skinny and tall. 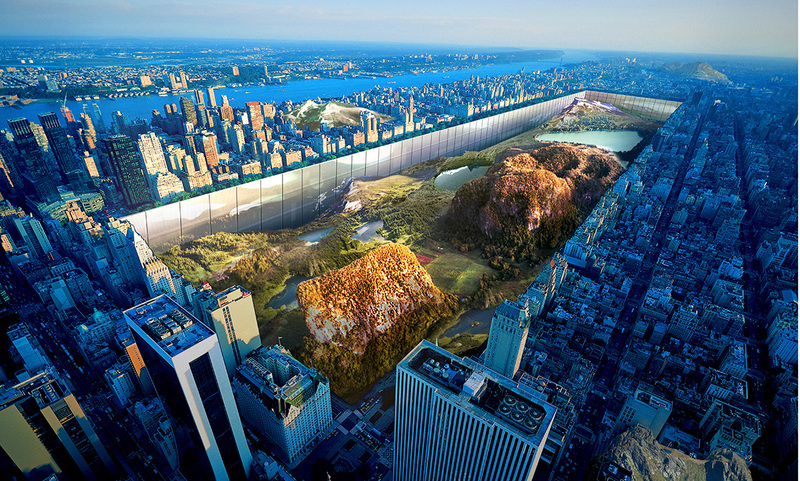 Rather than constructing another slim tower by building upwards, “New York Horizon” envisions a new paradigm by digging downward to Central Park’s bedrock, which will reveal the park’s rugged natural terrain while also creating a continuous wall of skyscrapers around its periphery to house habitable spaces with unobstructed views of the new underground park. Envisioned by Frederick Law Olmsted and Calvert Vaux over 150 years ago, Central Park was so beautifully designed that the people of today overlook the fact that it is actually an artificial piece of land built upon the once rugged, bedrock-strewn landscape, which had to be heavily sculpted in order to show any semblance to a park. The project’s inspiration builds upon Olmsted’s theory of providing equally accessible common green space to all citizens and giving people “greater enjoyment of scenery than they could otherwise have consistently with convenience within a given space”. His vision, however, is slowly disappearing as skyscrapers continue to rise higher than ever around the park. And unfortunately, only the affluent few that can live and/or work on top of these towering skyscrapers are given the benefit and enjoyment of the park’s total stunning view on a daily basis. The project was conceived to contrast against the city’s densely constructed buildings and towering skyscrapers, as well as, to provide New Yorkers with a natural environment that they could enjoy and use as an escape from their busy urban lives. Consequently, the soil removed from the park would be used to add a more dynamic landscape (mini-mountains, hills etc.) to underdeveloped plots all over Manhattan. This would create a new urban condition, where the newly constructed landscape becomes a cohesive part of the city. The 1000 feet tall, 100 feet wide wall of skyscrapers/mega-structure would create 7 square miles (80 times greater than the Empire State Building) of habitable indoor space, while introducing more natural diversity and verticality to the once flat 1.3 square mile Central Park. The seven-mile-perimeter wraparound mega-structure would contain apartments, retails, museums, libraries, etc. within the 100 feet deep inhabitable walls, with an unobstructed view and connection to the park. Following Manhattan’s city grid, there are main circulation cores (elevators) that would align with every single street from 59th to 110th street to transfer people down to the park, as well as to other various floors. Secondary circulation (ramps, stairs) would connect separate spaces in various scales between the cores. The goal of the concept is to reverse the traditional relationship between landscape and architecture. Instead of building distant, flat landscapes to surround and complement individual architectural buildings, the natural landscape is now the centerpiece. In this case, the dynamic landscape is surrounded by characterless architecture that tries to be nothing but mirror that reflects nature. In the heart of New York City’s concrete jungle, a New Horizon is born. Drone technology, adopted by many large corporations, has become a leading trend in the field of fast-delivery, aerial mapping, commercial advertising, government inspection, and filmmaking. As recent years have witnessed a rise in the development of drone technology, several major corporations, such as Amazon, DHL and Walmart, have begun investigating the use of drones in high-speed delivery service. As more and more people live on internet-based lifestyles, these “small flying robots” could easily become an ordinary part of future everyday life. The demand for high-speed drone delivery is estimated to increase continuously in the upcoming years. However, legal restrictions on the navigation of drones are currently standing in the way of drastically broadening the use of drones in various aspects of our daily lives. No-fly zones and conditions to maintain visibility with the drone at all times are two of the main constraints. The Hive is an infrastructure project that can better meet the emerging demand for incorporating advanced Drone technology into daily life in New York City. The project was proposed as an alternative asset argument for the usage of the land on 432 Park Avenue, the project aims to create a central control terminal that hosts docking and charging stations for personal or commercial drones (unmanned aerial vehicles) in the center of Manhattan. The current air-zoning regulations are to be re-shaped in a vertical highway model around a tower. This centrally controlled model will be more appealing to the legislative sector as it adheres to the concerns about regulating drone traffic. The primary location of the building does not only gather the commercial power of Manhattan, but also stands away from the no-fly-zones set by the FAA. The Modules on the façade are designed to fit nine different types of drones, categorized by the shape and scale of their landing fixtures (point, bar or ring). A sequential study of how to categorize non-uniformed industry products into modular fixed architectural structures was conducted through a series of simplification of the geometries and articulations of the forms. The different sizes and geometry of the drone paired with different size and geometry of the module result in a variety of configurations. To provide a safe landing environment, the tower projected a new method for drones to dock horizontally onto their corresponding platforms with the fitting shape and scale; the platform with docked drones can be flipped vertically to be in parallel with the tower façade. The façade is constantly animated as the platforms flip outwards and backwards to nest back into it. The overall organization of the façade uses layering as means to maximize surface area, with two overlapping exterior layers and an inner layer. A hierarchy is established, as the size of drones and modules is smaller in the inner layer creating a more intricate interior that can be accessed by the smallest drones by a major opening in the façade. Data is proliferating: every transaction, entry, emails, and even every mouse click is stored in a server. Annual global IP traffic will pass the zettabyte threshold by the end of 2016, and will reach 2 zettabytes per year by 2019. Considering this, a problem in the near future will be to find a place to store this information. A data center is the physical location hosting different servers used by many types of companies, it is used to store and process all the information we generate every day. Today data centers consume a lot of energy and have a large carbon footprint: servers absorb a lot of electrical power and they need to be constantly cooled down to avoid overheating problems. •	Climate: Iceland’s proximity to the Arctic Circle allows exploiting cold temperatures and a fresh natural breeze that could be used to cool down the servers avoiding the costs of a traditional cooling system. Our project is a vision of how could it be a future green data center located in Iceland. A data center is often a large industrial building without a significant architectural connotation, a big anonymous container. The main issue of our project is to investigate a new morphological solution that could represent both the complexity and the importance of the building into which we keep our data. Above all, we conceive the data center’s configuration in order to maximize the use of the available renewable energies and also to allow the re-use in a sustainable way. 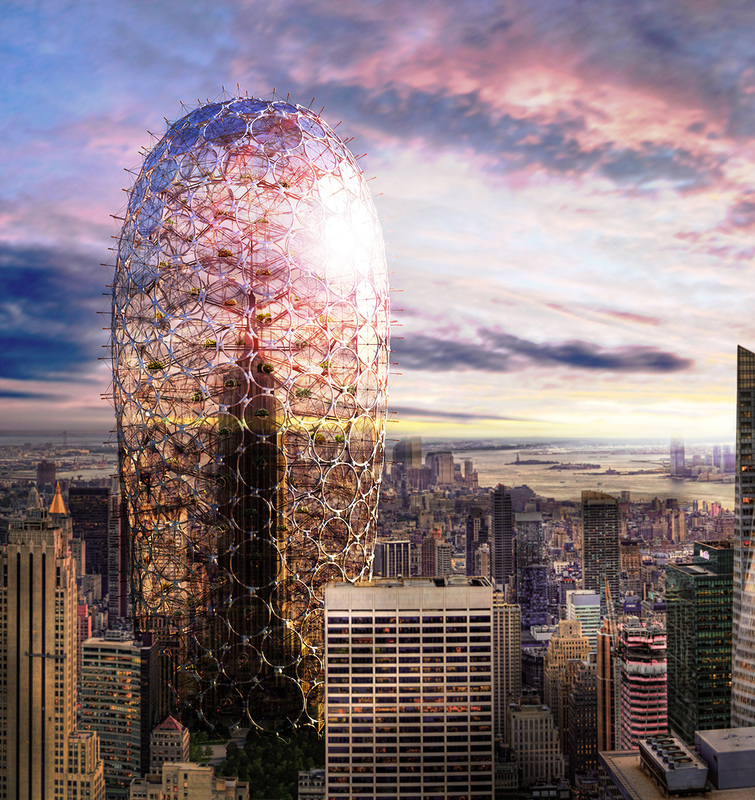 The tower is conceived as a giant 3D motherboard with a cylindrical shape. On the external façade are fastened all the hardware components, otherwise the internal part is empty. This void is a technical space with a double function: first, it is the main air duct of the cooling system, and second it is a space where the pods can be moved to the ground floor, during the maintenance and the upgrade phases. 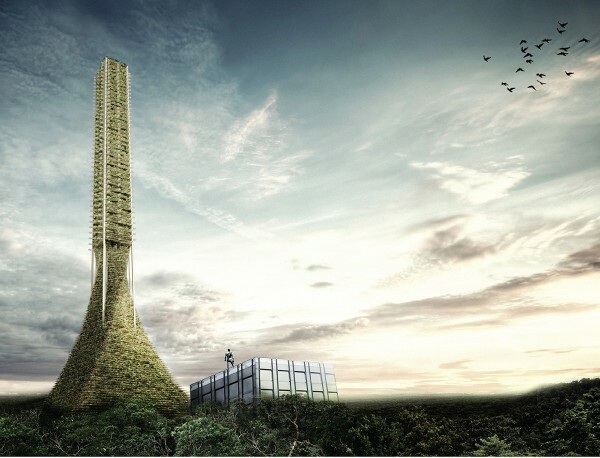 As well as in a computer case, a huge cooling fan on the top of the tower activates a natural chimney effect, thanks to which each pod takes the natural fresh air from outside and releases the warm air inside. A part of this air is expelled from the top of the tower, another part is re-used to heat the laboratories and the greenhouses situated in the basement. During the winter the warm air released by the server could be also used to heat the houses in the surrounding neighborhood. The medical and health organization of a country includes the country’s security and improves the health of the people, the treatment of diseases and injuries of persons, organizations, systems and processes. The hospital plays a very important role in the system. However, the world is generally encountered in the case of lack of hospitals to serve the patients, at the same time, the chaos of the hospital streamline is not convenient for patients to use. 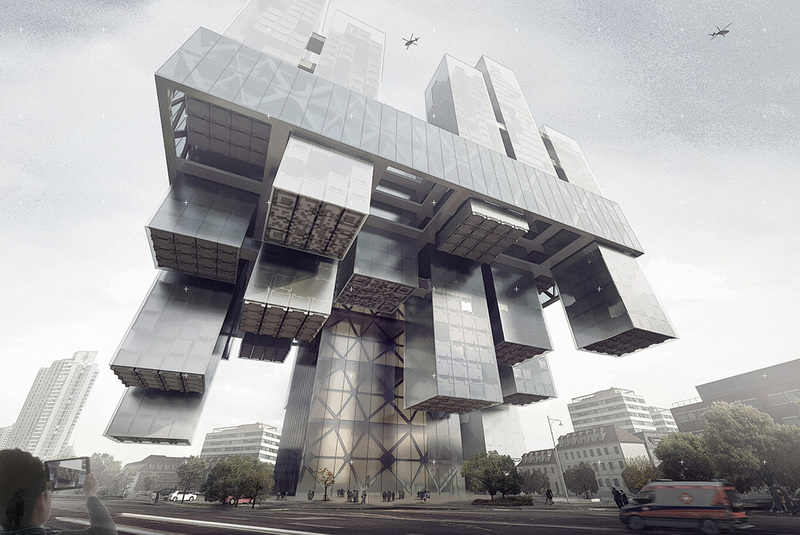 A space and tectonic responsive hospital is easy to assemble and reflects the society. It shows the BMI from the morphology of itself. Morphological changes can be suitable for various terrain environments, at the same time according to the functional requirements to change in morphology. The medical building tries to solve the medical problems, so that the building can reflect the urban living conditions of the urban human settlements directly. The building collected within 10 km radius of the residents’ health data, which is reflected from the building surfaces directly, and the internal function (inpatient, emergency treatment, medical technology, and the outpatient which contains 50 departments) consistently. Patients arrive at the hospital, and enter the core tube directly to the emergency treatment and the outpatient departments directly. The patients who need the in-patient treatment will transfer to the wards. The idea of the hospital is that the patient does not have to move by himself, according to the motion track, the wards can move to where it should go to, like the outpatient space for further consultation with a doctor instead. However, if there are not too many patients of any department, the space for the outpatient and in-patient will be folded to form a therapy garden space. The whole building is divided into a frame, a core tube structure, a large assembled body, which is an independent department module, and a small mobile body which is a medical cubic module inside the large assembled body. The small medical cubic module could move on the track in and among the large assembled bodies to form the body of the independent department. It is the mechanism that drives the actuator to move, according to the command signal sent by the control system, the module moves with the aid of the power element. It is the input of the electrical signal, the output of the line and the angular displacement. It is a real-time detection of movement and work, according to the need to feed back to the control system, and sets the information after the comparison, the implementation of the organization to adjust, to ensure that the action is in accordance with the requirements of the scheduled. New York City is a city of large high-density buildings that sets a trend for people’s life and goals. A lot of people are still trying to come to the city with a utopian dream. However, at same time, people are running out of town because of they struggle with urban life causing little social diversity. There are countless skyscrapers in NYC but people cannot recognize existence of the places because the buildings don’t have specific features. A definition of a place is a particular portion of space, whether of definite or indefinite extent. However, in the building, the space is not limited by the fundamental dimensions of “place”. The place is a space people can feel the existence and specific emotion. The morphosis design of organic creature integrates diverse experience that blurs the boundary between spatial relationships. The space uses the city’s landscape as a background, and façade as an experimental symbol, which is stunning the society and evoking people thought to explore more value of the community. Spatial atmosphere also creates an opportunity to experience some special interior phenomenon and moment which people may get inspired and surprised. It can be considered as a chance to provoke people’s passion about aesthetic urban life and turn those passions into a diverse way of thinking. In the façade, morphosis design of organic creature makes many different diffuse light qualities, which can produce various interior atmospheres. When people experience the space, the bright light lead and gather people who are losing way from dark area, then the dark zone attracts people who are holding a strong curiosity. The contrast of small-scale rooms and large-scale atriums gives people various spatial inspirations on the difference of urban scale. Air-Stalagmite is a high-rise designed to emerge in the most polluted areas in the world. This project recognized the environmental problems originated after the Industrial and Technological Revolutions – two centuries of a very high consumption of natural resources around the globe. Droughts are a recurring feature of California’s climate, and the current four-year period starting from the fall of 2011 has been the driest in history since recordkeeping began in 1895. California is in fact the world’s fifth-largest supplier of food and most of the farming depends on irrigation, which usually accounts for about 80% of the state’s human water use. In 2014 growers lost about 6.6 million acre-feet of surface water and 2.2 billion dollars because of the drought. California, much like the rest of the planet, is in dire need of immediate rain and snowfall; long-term water conservation and storage strategies for the future; and responsible architectural designs that incorporate innovative technologies to help preserve the earth’s environment, before it is too late. Looking to the sky can be a solution. Cloud seeding has been around for many decades and used throughout the world in various strategies. China used cloud seeding in Beijing just before the 2008 Olympic Games in order to clear the air of pollution. Farmers in the midwestern United States shoot flares of silver iodide out of planes to help spur rainfall in that region. It is more and more becoming a popular weather modification tool to help combat drought, famine, pollution, solar radiation, etc. Clouds contain super-cooled liquid water vapor. A rainstorm happens after moisture collects around naturally occurring particles in the air, causing the air to reach a level of saturation at which point it can no longer hold in that moisture. The process of cloud seeding essentially provides additional “nuclei” around which water vapor molecules condense in the cloud. These nuclei can be salts, dry ice, or silver iodide, which are all effective because their crystalline structural forms are similar to that of ice. The water vapor molecules combine with the added crystals to induce freezing nucleation, resulting in larger heavier water droplets and eventual precipitation. 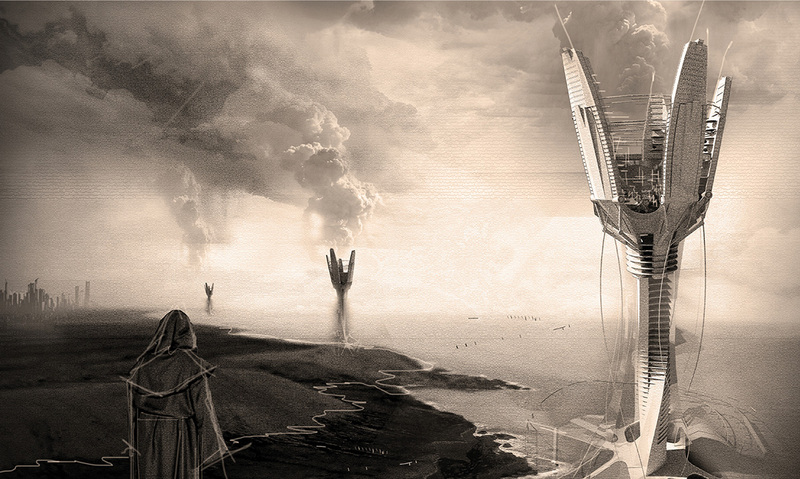 The architectural concept imagines a future earth where cloud seeding has become the standard process to modify and manipulate the weather. Cloud seeding can result in many positive environmental outcomes including temperature control, flooding prevention, decreasing pollution, dispersing fog, and deflecting solar radiation. But for the purposes of California, it is mainly used for irrigation and rainfall to combat droughts and famine. Towers are erected near the coast so as the lower marine layer clouds pass overhead, they can be seeded at different times and intervals, causing precipitation to occur in as little as 10 minutes. After years of practice, scientists have been able to pinpoint the exact amount and timing of release of chemical mixtures in order to manipulate the path of a cloud after seeding and predict where the rainfall will occur. Thus, rainfall is dispersed or “doled out” to cities and towns further inland that are suffering from drought. This is an imaginary future, where resources of nature have been used and reclaimed exhaustively by the greed of man to the point of irreversible damage. Spanning across the landscape by human intervention, until there is no more nature left for the upcoming generations to see. In those days where the impermanence of concrete can not withstand the true forces of nature, the solid ground is soon to be covered by earth, minerals and eventually the green, growing on top are the woods that would stem deep and span miles and miles, beyond the imagination of mankind. We build these super structures that would spread throughout the city, as if they were grains of seeds that would uncontrollably grow, taking back what was once theirs. When the forces of nature is too strong for men to resist, we would have to learn how to cope with nature in order to co-exist with the earth, occupying less surface on ground as much as possible, tall vertical super structure is the proposed solution. The Babel skyscraper can accommodate food security and living space for both nature and human. 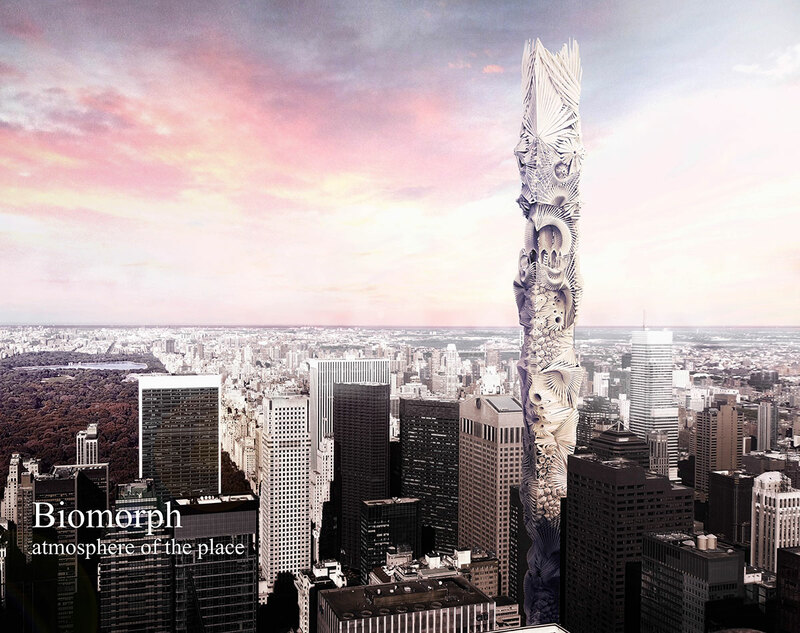 To achieve this, the architecture is designed with a concept of the emergence twisting parametric mountain, seamlessly flow with the geometric skyscraper. The building is designed with only floors to provide the vertical spaces; with open plan and inside void, providing ventilation. The Babel skyscraper is located in many sites around Bangkok. People visiting and living there will once again experience the natural habitat; bringing back the intimate bond we once have being so close to nature. The homogenizing of concrete landscape had us forgotten our relationship with nature. This future is to re-imagine these connections and visualize them. This connection would also form a more intimate symbiotic relationship between nature and humans. During the first phases, the architecture only contains the mountain-shaped base and vertical columns, which would eventually grow into an Eden, a relaxing park and food bank, for the organic vegetables and rice. The architecture itself is time-based and would change dramatically through the years. 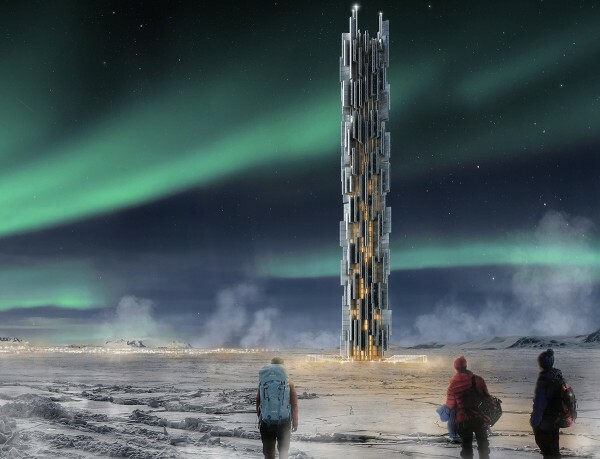 And in the times where human can no longer walk the earth, this skyscraper is where humans can depend on as inhabitants, traveling up and down by drones, a technology of the future, which we foresee. We’ve planned many possible locations for this this skyscraper in order to spread the green effectively throughout Bangkok, Thailand. Neglecting the living of man and let nature flow through every street and avenue of the city, eating up the main vessel and eventually the heart of the what we see as places, until there is nothing left for man to stand and looking back at what we’ve done to the earth. This set of skyscrapers would be a symbol for the cruelty we’ve done to nature, and what we have to pay back; including how human should adapt in order to survive. The design is something that may or may not have happened in a world beyond our imagination, and the architecture not as we recognize today, but as seeds that that takes us back to the past where nature rule the earth and where man are but just another creature that walk the planet. Nature here plays a crucial role in the establishment of the architecture, unlike the ones we see nowadays, being changed and adapted, according to the use of man. Modern cities have faced extreme changes due to developments of the Industrial Revolution and the urban sprawl caused by population increase. Artificial environment, cities, offered diversity of opportunities and new lifestyles which humans comforted with. However, this benefit jeopardized the balance and harmony of natural environment. Capitalism, while making possible these megacities, also brought severe side effects such as economic polarization and social imbalance. Once expected to guarantee prosperity of human lives, technics and systems, are now even considered as threats to the coexistence between human and natural environment, and human communities. Architecture of the past reflected the overheated technologies in competition of developments and selfish gain of capital. However, as the question of coexistence and balance is brought to the surface nowadays, how will the generation’s idea change this selfish gain and what kind of form will modern architecture will take as its phenotype? Today, 54% of the world population live urban based lives, megacities of population over 10 million keep increasing. Skyscrapers were born from the necessity to disperse dense complexity of horizontal cities by vertically expanding and reconstructing, in order to make a more effective use of scarce land. Moreover, many cities passionately competed in building more skyscrapers since they were often taken as outcomes of their economic success. State of the art technology and highly concentrated capital turned New York into city of skyscrapers. The Empire State, completed in 1930 becoming the world’s highest man-made structure, was imprinted into the mind of people as the symbol of prosperity and a great leap towards success. This piece of architecture visualized the harsh competing nature of capitalism itself, which is the driving force of the idea. Simultaneously, making scenery that even shows the severe polarization of capital, shabby slum streets of the city in contrast to the world’s tallest building. The urban areas in earth, which just account for just 1% of the Earth surface, uses 75% of the total energy, and responsible for 80% of green gas emission. It was found that NYC, which developed into the first megacity to have population more than 10 million in 1950, uses the most excessive energy and resources amongst all the megacities. UN predicts that by 2050, the world population will go over 9 billion. Cities will be overcrowded in due to accept this change in population, which makes experts believe that demand for skyscrapers will continue to increase. However, these demands are in contradiction with the social and environmental problems that could be caused if the megacities like NYC continue to spend energy and resources at this rate. Thus, to satisfy these demands, we need to have a sustainable model for a skyscraper.